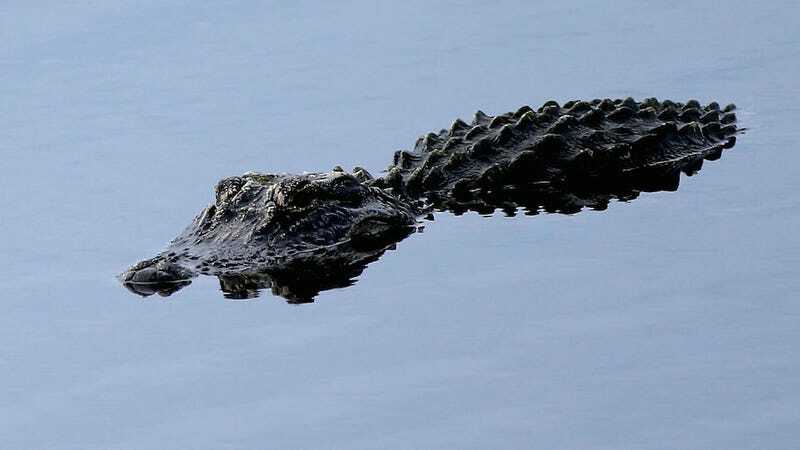 James Barney Jr. of Saint Cloud, Florida, just made bank in bragging rights after fending off an alligator in an attack left him with minor injuries—and the tooth of the gator that bit him. "I just immediately hit it and I let it go a little so I pry its jaw open," James Barney Jr. said. "First I thought someone was just playing with me and I didn't know what happened. I reached down to go grab it and I felt its jaw, I felt its teeth," Barney said. Yep, he hit that gator, which I'm assuming is something you're supposed to do if bitten by such a creature. James suffered three "superficial" bites and was airlifted to a hospital, where he underwent surgery. He's doing fine now, and besides, that gator tooth will bring him cred for years. Having said that, AUGH CHILDREN PLEASE DON'T SWIM IN RESTRICTED AREAS PLEASE. Meanwhile the 400-pound behemoth is still at large. Maybe in a bid for redemption, it will find its way to the sewers, suffer toxic waste poisoning while developing a penchant for the kusarigama and fight Michael Bay's Teenage Mutant Ninja Turtles.